Though I love to bake from scratch, sometimes it is so worth it to bake semi-homemade style. These funfetti cookies are a testament to that. Funfetti cookies, a step-sibling to the adorable funfetti cakes, have always been a staple for my family, but surprisingly I realized this last Christmas that Rob has never had one that he can recall. Granted, my mother-in-law doesn't bake much, but this is definitely her kind of baking so I couldn't get over the fact that he claims she never made these for him. With the urge to bake something quick and easy that I knew Rob would love, nothing was appealing to me (that would appeal to him). That is - until I was making the turn to head to the check-out at the grocery store last weekend. Right in front of me was a huge Valentine's Day candy display, along with boxes of Valentine's Day themed funfetti cake mix for $.99. Yes, less than a dollar - I had to snag it up knowing that I had to make Rob some funfetti cookies! 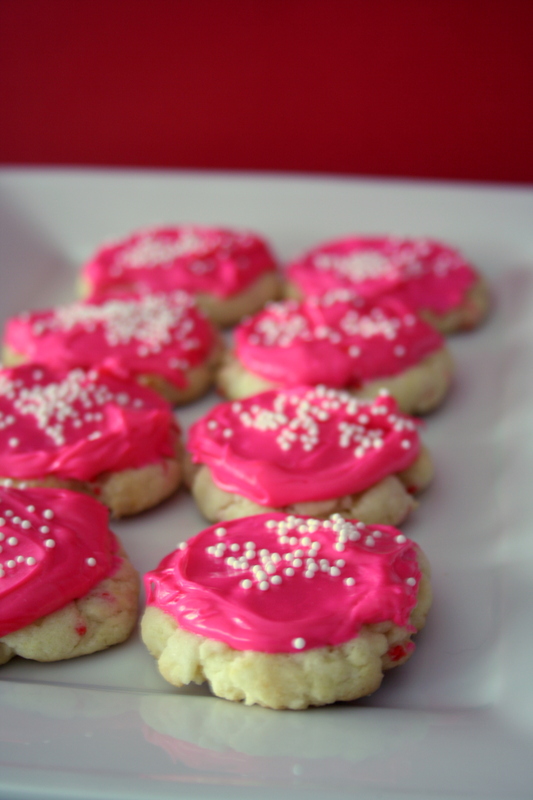 To be honest, though these cookies are a staple in my family - I've never actually made them. Maybe it's because once I started baking I tried to stick to baking from scratch, or maybe it's because they're not "new" to me so I didn't see the point in baking them when I knew that I'd have them the next Christmas. Regardless, I'm glad I finally decided to make them because with the little one on the way it's good to learn some super quick, easy, kid pleasing desserts. Though baking from scratch isn't hard in my opinion, it does require a little extra prep that I may not have time for in a few years when I just want to bake with my kids! Being that I never made these, I actually had to search for the recipe. It wasn't hard to find, but then when I went to open the box I noticed the recipe was right on the side of the box. Oops! There really is nothing easier than these cookies and I'm sure one day I'll look around for a homemade version - but until then these will definitely work. They're so delicious - they taste like they're completely from scratch - no one has to know you need only 1 bowl, 1 spoon and 4 ingredients! In a large bowl combine cake mix, eggs and oil until thoroughly moistened. Add candy sprinkles from box and fold in well. Shape dough in to 1-inch balls and place two inches apart on an ungreased baking sheet. Take a glass and lightly press cookies to 1/4" thickness. Bake for 6-8 minutes or until edges are just golden brown. Cool 1-minute then remove from pan and place on cooling rack. 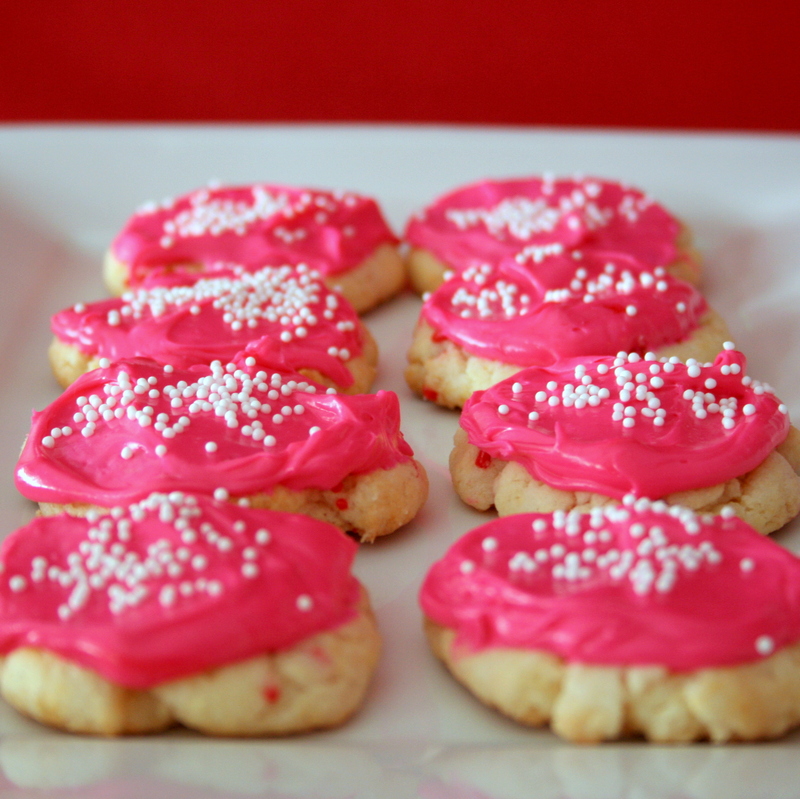 Spread frosting over warm cookies and immediately sprinkle with candy from frosting, or with desired decorations.